We’d like to thank all of you who participated in the survey held in May/June this year. It is arguably one of the most important activities the Trust is involved with on your behalf. It is an important barometer of our concerns, issues and views on the Club and in addition the results feed in to the motions you vote on at the AGM which in turn become CST policy for the year ahead. We will be meeting with the Club to discuss the survey results in detail and any concerns and issues arising in November. The response rate has increased due to our decision to open the survey up to all Chelsea supporters. 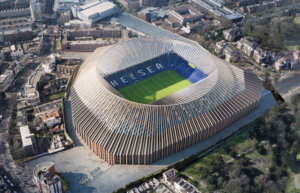 On-pitch success; Stamford Bridge redevelopment; ticket pricing and ticket access are considered the most important issues for supporters. Satisfaction with the Club Administration has improved and returned to 2015 levels (highest since the survey was started). Concern was expressed about the additional time, cost and inconvenience in attending matches at whichever temporary stadium is chosen during the redevelopment. In addition, creating a good atmosphere is seen as paramount. Safe Standing continues to receive wholehearted backing with the hope that the redeveloped stadium will be able to accommodate sections with rail seating. There is frustration with away ticket availability and the Loyalty Point system, although the £30 cap on away tickets has been welcomed and in part has led to an increase in demand. The change in kick-off times due to TV re-scheduling has become an issue of great irritation for supporters. Overseas supporters in particular have expressed their frustration in obtaining enough loyalty points to attend matches later in the season and also suffer more than UK based supporters with changes in kick-off times. 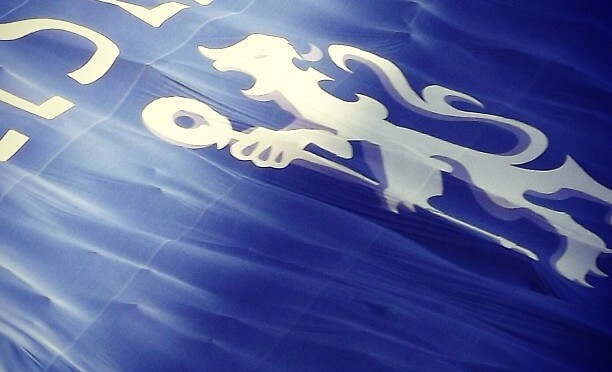 This is the fourth annual Chelsea Supporters’ Trust Membership survey. 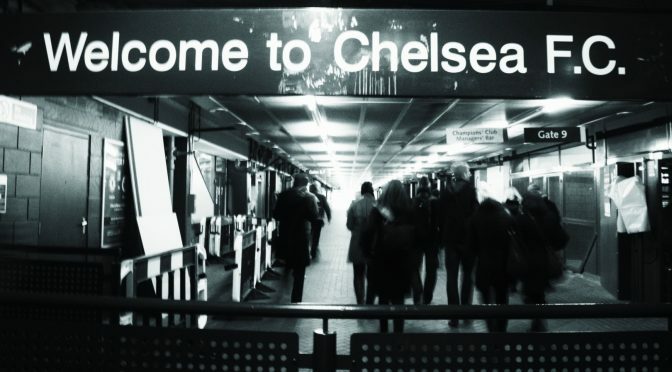 The goal of the annual survey is to identify the issues that Chelsea supporters care about. This survey was conducted from the end of the football season (16 May) to mid-June 2016. It was sent out to both the voting and non-voting membership. The overall response rate was 25%, with a 44% response rate from Voting Members. A section about the potential temporary stadium move ahead of the new stadium development was included this year, to provide information about Supporter concerns regarding this issue. Some questions have been slightly reformulated to provide more consistent data and a question about Supporter Liaison has also been introduced. The results of the summary inevitably reflect the relatively unsuccessful 2015/16 season. For the first time, ticket prices and atmosphere, although still ranked highly, have been superseded by concerns about on-pitch success and related categories of youth player development, transfer policy and management stability. Despite the on-pitch difficulties, satisfaction with Club administration is only slightly down on last year. It is disappointing to note that only 20% of respondents were aware of the Supporter Liaison Officer role at the Club and less than 5% knew his name or how to contact him. CST members welcome the Away Ticket Cap agreed by the Premier League and over 60% said that they would now attend more away games. However concern was expressed that it would be even more difficult to obtain these tickets. Home ticket prices are still considered to be too high. Availability and location of juvenile tickets remain key concerns with regard to pricing, access and atmosphere and there continues to be a demand for a price category for young adults. Although a move to a temporary stadium in any of the venues currently touted will not materially affect weekend attendance, most respondents consider that time and/or cost of travel will increase significantly. The primary opinion is that the Club should ensure that pricing takes account of this. There is a strong possibility that attendance of midweek games will be affected, particularly if the move is to Stratford. About a quarter of respondents stated that the new European ticket collection arrangements were a factor in not attending away Champions League games. Although most agreed that the Club made the collection location convenient, the majority stated that the process ate into time for pre-match activities. Respondents were asked to rank in order of importance what they considered to be the five most important issues. The rest of the survey explores these key issues in greater depth. The highest importance was given to On-pitch success, followed by some distance by Ticket prices, Stadium redevelopment and Atmosphere. Receiving the most votes overall were: Development of young players, followed by On-pitch success, Atmosphere and Stadium redevelopment. Ticket Prices have been the number one concern in the last three of the annual surveys but, although this is still important, this has been overtaken by On-pitch success. Stadium redevelopment replaced Stadium relocation from previous surveys and features in the top four for both highest importance and votes overall. 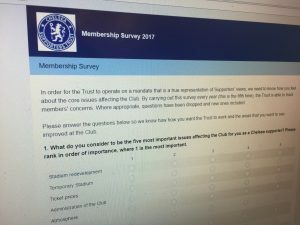 This is the third annual Chelsea Supporters’ Trust Membership survey. The goal of the annual survey is to identify the issues that Chelsea supporters care about. This survey was conducted from the end of the football season (25 May) and the end of June 2015. It was sent out to approximately 2,020 Trust members. The overall response rate was 30%. This year a decision was taken to limit questions about ticketing and the stadium, including atmosphere, to members who attend matches. The aim of this was to reduce the number of ‘not applicable’ answers and make the survey simpler to fill out. This change does not appear to have made a material difference to the trends of the previous years. Below is a summary of the survey. 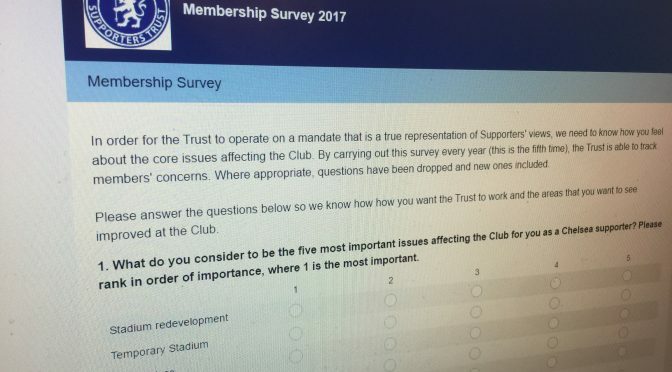 The quantifiable results of the survey are generally on a par with the previous year; ticket prices and atmosphere considered to be the main concerns, while approval for Club administration remains healthy. Management stability and development of young players continue to receive a high agreement rating. A number of new issues were raised this year. Concerns about access to away tickets, the purchase process, ground capacity and touting have a basis in increased demand due to the team’s success during the season. The extension of the age range for juvenile tickets, while welcomed, has raised problems of its own. Availability of this concession is in the Family Section but very few tickets are available in this area since most is given over to season tickets. The suggestion is to make concessionary tickets available in all parts of the ground, setting a cap on numbers if necessary to minimise loss of revenue. The extortionate price of some away game tickets is noted. Price categorisation has made Chelsea supporters victims of their own success with several opposition clubs charging £50 or more. Chelsea also operate this policy and this makes the cost of regular attendance at home games a problem for non-season ticket holders. The survey’s respondents were enthusiastic for the Football Supporters’ Federation campaign for an across the board reduction in away ticket prices. 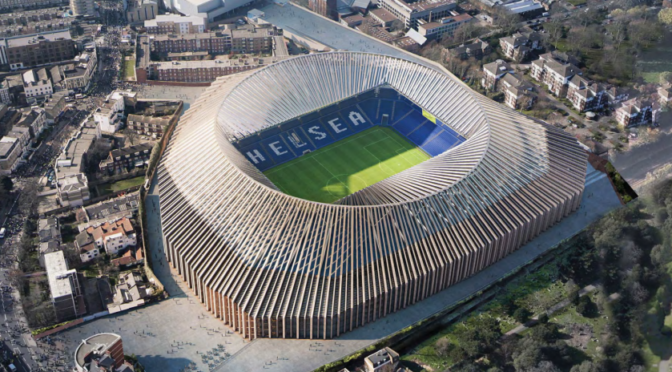 Safe standing, relocation of away supporters and tourists and cheaper ticket prices are seen as the means to improve the atmosphere at Stamford Bridge. Whilst acknowledging that the Premier League TV windfall has been used well by the Club to subsidise away travel and some away tickets, the majority of participants agree that TV money should be used to reduce prices across the board.